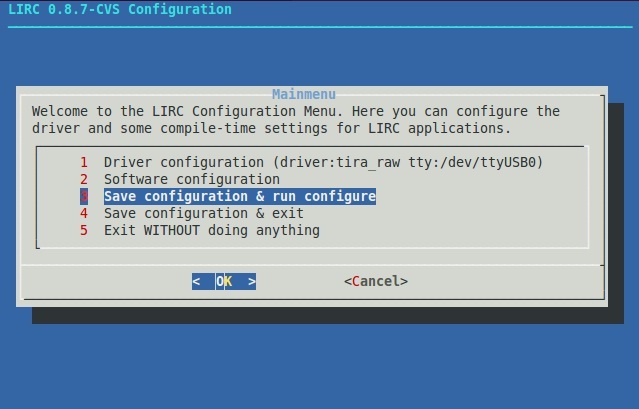 This tutorial will help you configure LIRC for use with Ira / Tira devices in a few steps. Plug in your Ira/Tira device and wait a few seconds. Execute the above command again. Compare the two lists. 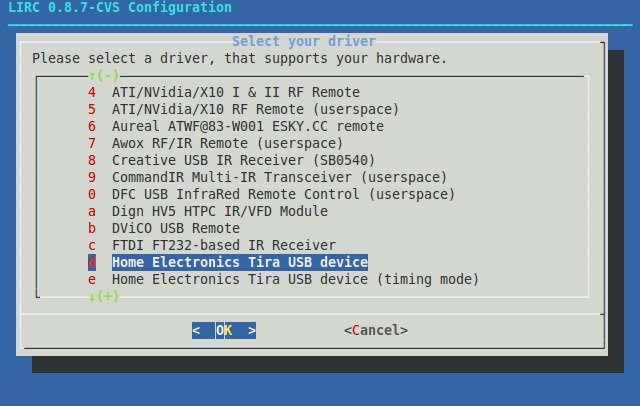 The device that appears only in the second list corresponds to Tira 2.1. Currently the LIRC version that has full support for Ira / Tira can be downloaded from the LIRC cvs repository. 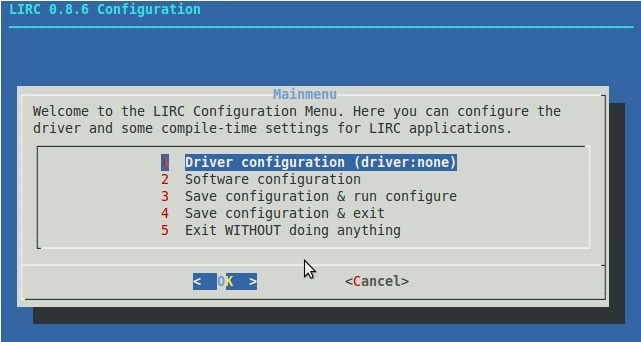 You also found information how to start LIRC configuration. 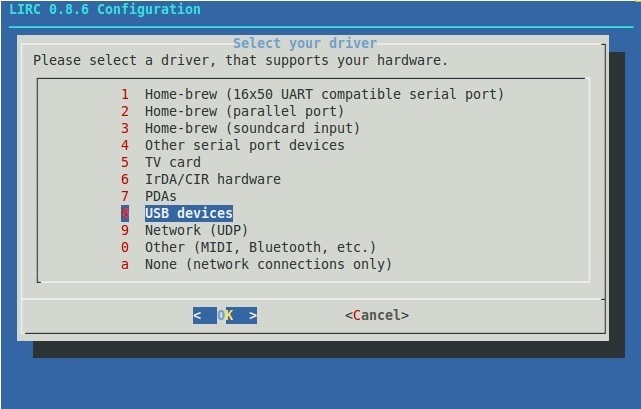 Select Driver configuration in the initial screen. Now you can choose from two different drivers,depending on usage. With the first driver which works in six bytes mode, LIRC can receive IR signals from far distance which can be used to remote control your PC. With this driver sending IR signals is also possible. The second driver which works in timing mode, has only one purpose, to record IR signals which you can transmit later. In this mode, Tira uses a short distance receiver which can receive IR signals from 4 inches (10cm). 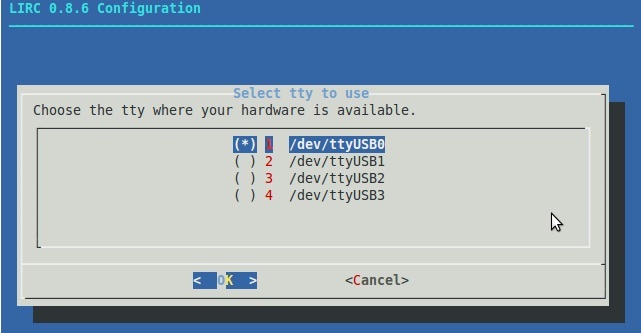 In the next screen you have to set the usb port address of your device. Step 1 contains information how to determine this address. Select Save configuration and run configure in the next screen. Now you have installed LIRC. to list available buttons names for recording. You can record signals in both 6 Bytes or Timing mode. Start IRRECORD again with flag -f to force RAW mode. "myremote" is the name of the config file where IRRECORD will store the remote control signals. Note:you will need to know this name for sending IR signals, as irrecord stores it in the config file as the remote control name. IRRECORD will give you instructions to do. First,it will analize the IR signals. For this reason in Timing mode: you will be asked to press as many buttons as possible and hold each of them down for about 1-2 seconds. It will draw dots on the screen. Hold down each button until it generates 3-5 dots. When IRRECORD received enough IR signals it will notify you about the gap signal,and asks you to enter the name of the button what you want to record with the following message: Please enter the name for the next button (press <ENTER> to finish recording) Use the names you listed before. (like KEY_0) You will be instructed to hold down the key,a few seconds later IRRECORD informs you if it was successful. When finished recording just leave the key name empty. 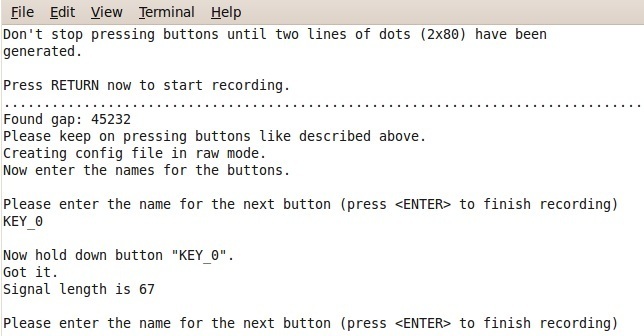 in 6 Bytes mode: the difference is that initially you need to hold down the same button for a long time to generate the dots instead of pressing more buttons as in timing. This example command will send the recorded KEY_0 button's IR signals.